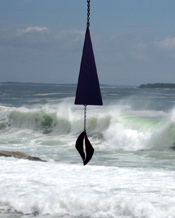 This wind bell is reflective in three sounds of sea bells, gongs and bell buoys off shore. The Sea Melody features an elegant and slender and expressive body. The 'Diamond Wave' (roughly 8 inches)windcatcher adds a certain heir of sophistication completing the Sea Melody Wind Bell.